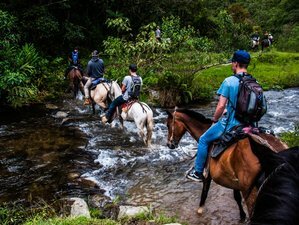 Join this horseback riding holiday and live a synergy between the horse, the beautiful landscapes, and you in Salento, Colombia! This holiday offers you a chance to experience a memorable horseback riding around coffee farms and nature with fresh air which can relax your mind and soul. More than that, during this holiday, you will stay in the beautiful Hostal Boutique La Floresta, offering mountain views, awesome hospitality, and great services. Embark upon an amazing riding journey in Colombia! During this holiday, you will be accommodated in Hostal Boutique La Floresta. You will stay in a double room with mountain views, a private bathroom, and a cable TV for two. In Hostal Boutique La Floresta, you will find the best views that the town can offer. It is a quiet, clean, and comfortable place. Hostal Boutique La Floresta is located in Salento, Quindio, which is very close to the Cocora Valley. There are Jacuzzi and hydromassage overlooking the mountains, a balcony, hot water, a television, breakfast, and a minibar. Fifteen rooms and four bedrooms are available to accommodate up to fifty people. You will start the tour of landscapes and coffee farms at 08:30 where you will learn everything related to the coffee process, how it is grown, how it is harvested, how it is dried, and the final step so you can have a cup of the best organic coffee. Then, you will follow the path to the river bank and find the path to the waterfall where you can take a natural bath and relax with the sound of water in this place full of nature. The estimated time is five hours (or more depending on the tourist). Located in the central mountain range of the Colombian Andes, Salento is the most visited in Colombia for its biodiversity. One of its charms is locals and strangers are able to walk and enter the immense mountains, crossing streams, and suddenly come across the highest palm in the world. If you are one of those who likes challenges and gets much higher, you can continue walking on endless trails through which you can reach the snowy natural national park. Salento is also a town of colonial architecture that seems to have fallen asleep in a deep and eternal sleep. When you see it in photos, you marvel at its colors and shapes. But without fear of making a mistake, this small terroir of Quindío is even more beautiful when you knock on the door and enter your home. What is not specified in the "what's included"
Hostel La Floresta Salento is a home for travelers. They provide horse riding, accommodation, and other tour services. The prices below are converted from COP to USD. Please note that prices may fluctuate, depending on the current exchange rates.